eD@HoMe: My first cover from Belarus! 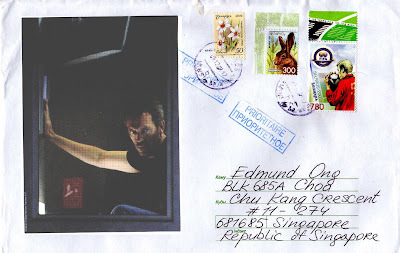 Many thanks to Nargiza for sending this awesome cover from Belarus! The stamp on the left of this cover is part of 8 lovely stamps from the "Gardens Flowers" series. It was issued on 10th June 2008. The stamps in the set depict Peony (20 r), Petunia (30 r), Narcissus (50 r), Tulip (100 r), Dahlia (B), Rose (A), Zinnia (H) and Lily (500 r). Next, is a stamp from the "Wild Animals" series, issued on 10th June 2008. The complete set features a Raccoon (10 r), European Mink (200 r), Hare (300 r), Wolf (400 r) and Forest Marten (1000 r). 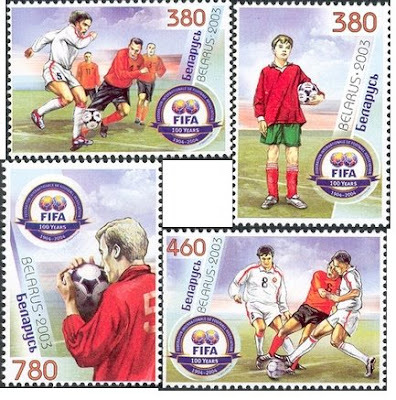 The stamp on the right is part of the "Centenary of FIFA" series, issued on 14th November 2003. In addition, Nargiza surprised me with a lovely FDC from the "Belarus indigenous birds"series, issued in 1993. Thank you very much!